Showering Rajinikanth‘s life-size cutouts with milk and flowers on the dawn of his every release are too mainstream now as a couple took their fandom to another tangent by tying the knot at Woodland theatres in Chennai to celebrate Petta‘s release. A video that is currently trending viral on Twitter shows the couple getting married in traditional South Indian style in the premises of the theatre with a huge poster of Petta, featuring their idol Rajinikanth, in the backdrop. The couple got married in the presence of their family members and the video of them was captioned as, “Truly Rajinified! 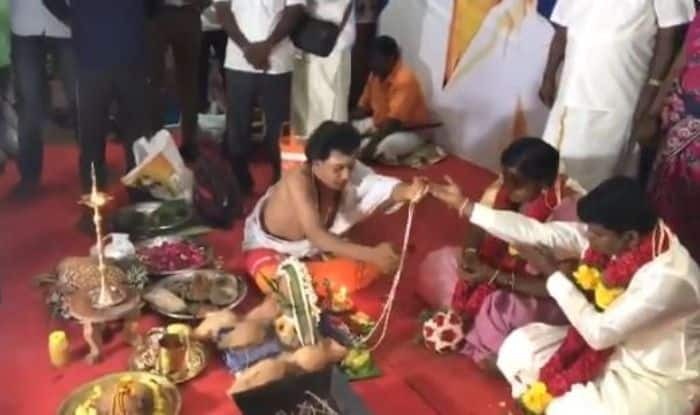 A couple/@rajinikanth fans getting married at Woodlands theatres in Chennai! #PettaParaak” (sic). The Rajinikanth starrer Petta, directed by Karthik Subbaraj and also starring Nawazuddin Siddiqui, Vijay Sethupathy and Trisha Krishnan among others, opened to housefull shows and packed auditoriums on Thursday. The film released in Tamil and Hindi today and the fans of the Thalaiva (meaning ‘boss’, as Rajinikanth is fondly called) went all out leaving no stone unturned for this movie just like his previous ones. In the interview with IANS, Petta’s director, Karthik, shared, “I grew up idolising Rajinikanth and I’ve always wanted to see him in a certain way. When I knew I was going to write for Rajini sir, I wanted to show him in the most stylish way and bring back his mannerisms and machismo.” Though Petta will now be tagged as Karthik’s love letter to his matinee idol, he clarifies that it will be a healthy amalgamation of Rajinikanth’s popular tropes and Karthik’s vision as a director. In addition to the fact that the film has everything a Rajinikanth fan wants to see, Karthik revealed, “The film has a mix of both our sensibilities. Rajini sir gave me an opportunity to work with him because he liked my work, especially my style of narration and dialogues. Now, I can’t go out and make something very different just to please him. He wanted me to make ‘Petta’ the way I want it and with my sensibilities intact.” Backing this statement by Karthik are the promos of the film which act as enough assurance that Rajinikanth’s fans are in for a treat.